Dimethyl Urea (DMU) based Hardeners - Similar to formaldehyde without allergic or over hardness problems. Along with Prostrong's Fluoride Nail Treatment and good general nail care there was one other product that helped me eliminate that darn peeling problem. The product is called DermaNail. It's a conditioning treatment. It's not a polish or an oil, but a unique solution with a few interesting ingredients (more on that below). I feel like DermaNail changed the condition of my nails on a very fundamental level with permanent results, but it was in NO WAY a quick fix. This product takes time and dedication to work, like any nail care routine. After all damaged nails have to grow out and as I have mentioned before it takes ~ 6 months for your nail to grow out fully from cuticle to tip. Hence, I would give it at least this long to see if it works for you. Yea, really, 6 months >.<, now that's dedication! This product is not well known and I myself happen to randomly stumble across it 10 or so years ago. One day I was doing some serious Lycos searching for a magic bullet to fix my peeling nail problem. Aside from all the claims on the box, what really got me was at the time they were giving it away as a free trial if you paid shipping and handling. Oh man I jumped all over that! This is a great hand and nail cream. I have to warn you though. One time I put it on and an hour later was like "what the hell is that stink??" Finally I came to realize it was my fingers lol. It has a unique smell, but IS great at what it does. I like to leave these little stinky guys all over so that I always have some moisture within reach. The ingredients in this product that do the dirty work are: butylene glycol (or similar) and acetyl mandelic acid. The glycol is a humectant. The chemical structure contains hydrophilic (water loving) groups which help retain water and keep your nails moist (like cake, lol). The acetyl mandelic acid is an apha hydroxy acid which smooths out (almost like an exfoliant) the nail surface, which consequently prevents nail splitting and peeling. Warning: THIS IS NOT A QUICK FIX! The bottle clearly warns that it takes at least 8 - 16 weeks to see improvement. I definitely attest to that and then some. I have only ever used dermanail and followed the direction on the package (see picture above). The product comes with this strange delivery system, that in my personal opinion delivers way to much. Why not a brush? Maybe this is more cost effective? Anyway, you slap this stuff on your clean dry cuticles (and nail edge if you want) twice a day (once in the day time, once in the evening). Then you avoid washing your hands for 1 hour afterwords. Where to get this treasure? I don't know why I do this, but whenever I come across something I want my first instinct is always, "how can I get this baby for free??" So initially that is exactly what I searched for online. To my luck and surprise the maker, Summers Labs, happen to be running a great deal for DermaNail: a free trial of the product, if you paid shipping and handling. It was around $5 I think. So my first couple of bottles I got for free. Afterwords I started searching for it online. The normal going rate at the time was ~$23 for 1oz. At some point I realized DermaNail did not require a prescription, but still could never find it in stores. I, per chance, went behind a pharmacy counter and asked them about it. They said they didn't carry it on the shelves because it wasn't that popular (obviously not many people knew about it), but they had some in the back or could order it for me. The first time around I think I got the Wal-Mart pharmacy to order it for me and I only paid ~$15 for it. I'm guessing this was the price the pharmacy buys it for because other times I had to pay ~$23. Some time ago, I was running low and happened to have a friend that worked at a pharmacy. Boy, I found out she could get it for ~$15, so hell yea I stocked up. Now I have the army you see above, lol. In terms of being cost effective, DermaNail is cheaper than NeoCeuticals. DermaNail ~ $27 per oz. However you can probably find both cheaper by doing a Google search. *Note: The company who makes NeoCeuticals nail conditioner has informed me that it was discontinued in the US so it is not available on their website; however, it looks like it may still be available for purchase online through other suppliers. I have probably gone through 4 bottles (off and on) of DermaNail without incident. Then at some point, only in the last couple of years of use, the skin around my thumbs began to split and crack, but the nail itself was healthy. This was really strange and my only explanation for it was that I was not following directions properly (i.e. I was not avoiding washing my hands for 1 hour after DermaNail application) AND not properly moisturizing my nails. However, I have no reservations about using this product again. I haven't used DermaNail for probably almost two years and my nails are still in great condition. If they ever started peeling or cracking I would jump back on the DermaNail band wagon in a heart beat. I feel like this product would be great for dry, cracked, peeling nails. Obviously its a conditioner so how can you go wrong?! Furthermore, I also think this would be a great product for very soft and peeling nails in combination with a hardener treatment. I would however keep the treatments separate just to avoid too much chemical mixing. First harden up the nail plate for a few weeks with Formaldehyde or Fluoride, then stop the hardening treatment and start DermaNail. Lastly, this may be a good product for people with ridges or whose nails split at the ridges. Because one of the active ingredients is an alpha hydroxy acid it has the potential to smooth out these types of nail surfaces and prevent the peel or split. I have made a video review for this product here. You're such a babe for doing this series, it's given me loads of options for a nail treatment - mine peel like a banana. SO gross. Just out of curiosity what category would Cuccio Horsetail strengthener fall under? This sounds like something that could really help me! lmbo, even though this series is a million miles long, it's seriously one of the most helpful things I've ever read on any nail blog ever. Amen. @KarenD - AHA's are a wonderful thing! @ChaosButterfly - Thank you, that really means a lot :D ... oh yay! taggie ... I am a slow poke, but I'll definitely do it! This is an amazing series. You've really helped me to grow long, beautiful nails after six years of acrylic abuse. I'm using Nail Life now(I bought it because I saw it in a photo on your blog. Yes, I'm obsessed. )but I'm going to buy DermaNail and tuck it away for future reference. Thanks so much for all you've shared here. Wow....I hadn't read up on the rest of the posts you did in this series, but after devouring this one, I think I will go and learn a thing or two...thanks doc! Seriously, this information can probably save a lot of people out there from major frustration....thanks my friend! im so happy i found your blog Through Karen D . ! finally a blog where i can learn about taking care of my nails. i can paint my nails but taking care of them is a whole different story.! hahahhaa. @ommorphiabeautybar.com - Thank you! This topic is such a big obsession of mine. Really, this is where it all began for me. Chemicals plus nail care ZOMG!! Hi, can I share this on my blog? I found it so interesting & informative and want to share your knowledge with all of my 7 followers!! My nails always peel so i'm going to give a formaldehyde based product a go, would never have dreamed of using any strengthener/hardener if it hadn't been for your blog, thanks. Wow, this is so informative, I love all your posts in the series. Could you possibly give your two cents on the "popular" nail hardeners & top coats in which are best for their ingredients? @jazzqueen64 - sure go for it! I hope you have success. That is a tough request mainly because "the best hardener/treatment" depends on what your current nail condition happens to be. If you choose a treatment that fits your criteria then it will be "the best" for you, but not necessarily someone else. Aside from that, each brand or treatment may have the same ingredients, but maybe slightly differet formulas that may be better for one person versus another. So you can see my dilema. Honestly I don't play favorites and am myself a total product h00r lol. My general opinion on top coats is that I love them, all of them. Each has their own purpose either for a specific time of for a specific polish. I'll work on a post though to describe this further. Hi, I hope it is not too late to ask a question about this product. Can you still wear polish and use it? Yes, I always did. I just applied the product at the base of the nail, waited 30 seconds or so, then wiped off the excess. I would then apply a moisturizer immediately after and many times throughout the day. What is a better solution to the problem of splitting nails, Dema Nail or Trind Nail balsam? Here's something I have started doing. I thought if whitening toothpaste with flouride works for my teeth, what about using it on my nails too?? I decided that whenever I take my polish off, I will squeeze a dollop (don't you just love that word?) on my nail brush and give them a "fluoride and whitening treatment." It's only been a week, so I'll keep you posted! Thank you so much for this series! It's very helpful to have a pro walk you through the long lists of ingredients in all these treatments. I was wondering what your opinion of Orly Nailtrition is? I've seen it mentioned on MUA a few times now as a great treatment for peeling nails. I'm not sure if it's a hardener or just a moisturizer and if it's really worth the high price. I have been using SOG (gelish mostly, some shellac and red carpet) they only chip when my nails peel. I have thinish peely nails. They do tend to break but after they grow to a perfect length. The breaks are usually peel related. (They peel thin then crack)The sogs seem to help with overall strength. could this product work with sogs? Is there any tips for using the systems together? So I'm a year and a half late, but... After reading this, I decided that I MUST have this stuff and ran to the nearest WalMart pharmacy counter. I was so excited when they actually had it in stock that I didn't even bat an eyelash when he told me it would be $32. Yeah. If it works for me, it will totally be worth it, though. My mother and I tried ProStrong way back in 94 or 92. At least I'm pretty sure it was ProStrong. I have been a nail biter for most of my life. I grew my nails out once and then somehow started chewing again. A little over a year ago I started using glue-on fake nails. Then, I splurged for gel overlays. About 2 months ago I filed of what was left of the gel overlay. My nails were trashed. They were paper thin and what little was left was peeling. I started using Dabu(Daby) to thicken and protect my nails. This worked great as long as I kept it on. But it kept peeling off my nails from the nailbed forward. I searched the internet and read some rather comical reviews of Quimica Alemana nail hardener. The reviews were raving about how well it worked. But they also mentioned some pain associated with it's usage. Being desperate to keep my nails in good shape, and also being a little glutton for punishment, I ordered it. I have been using it for two weeks now and it worked miracles. I just took the coats of today (to recoat) and my nails are stronger and they look and feel healthier. Even my tips are whiter, and I'm a smoker. I did experience a little pain recently when I tried to put on a couple extra coats. But, it was nothing like the pain of which the reviews warned. Note to my point, I had also read (in the reviews) that Quimica worked by changing the "makeup" of your fingernail. But it did not explain how or by what ingredient. Once I received the product I read the ingredients and saw the formaldehyde. Another google search and I came across this blog series. Thank you for writing it and explaining how the formaldehyde hardeners work. I think I am going to take a break from the Quimica and go back to Dabu for a little while. I plan on ordering the ProStrong (for use with the Dabu) and wil probably order the Dermanail. I am currently using argan oil and another oil-based nail moisturizer. 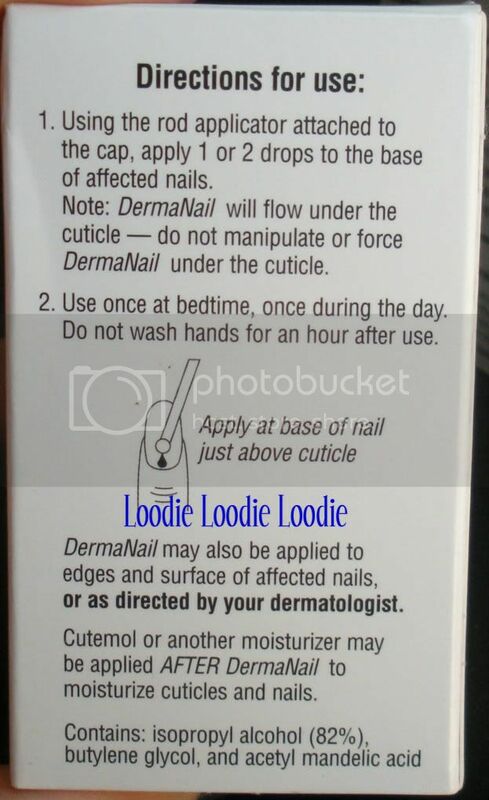 You aren't supposed to get your nails wet for an hour after applying Dermanail. Is that specific to water? Or would oil do bad things too? I'd like to boost my moisturizing but don't want to negate the good things Dermanail is doing for me. I work for a Dermatologist and he samples cutemol. So after seeing your video and talking to the reps I am trying Dermanail. I have lupus and it affects my nails greatly. I will give you updates. Hope you are still online!